Here you can learn the basics of how light reflects off of mirrors. After you're done reading about the mechanics, be sure to look at the applets page for a more hands-on look at mirrors. In a plane mirror, the focal point is at infinity and the image is behind the mirror. The object and image are equidistant from the mirror. 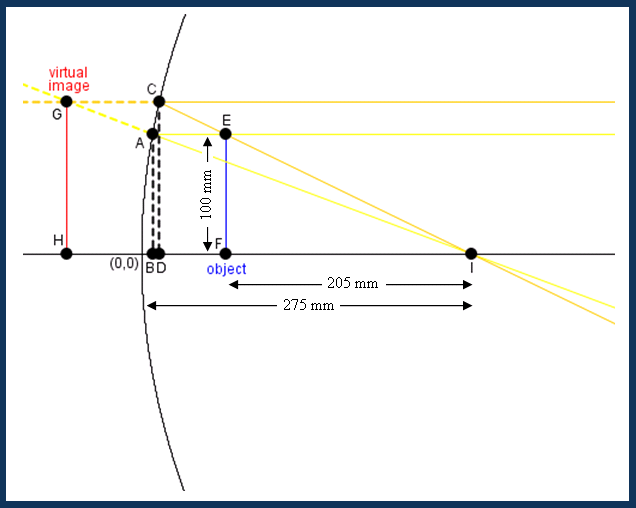 Problem: Given a concave parabolic mirror with a focal length of 275 mm and a 100 mm tall object that is placed between the mirror and its focus at a distance of 215 mm from the focus, find the height of the object’s image and the distance of the image from the focus. 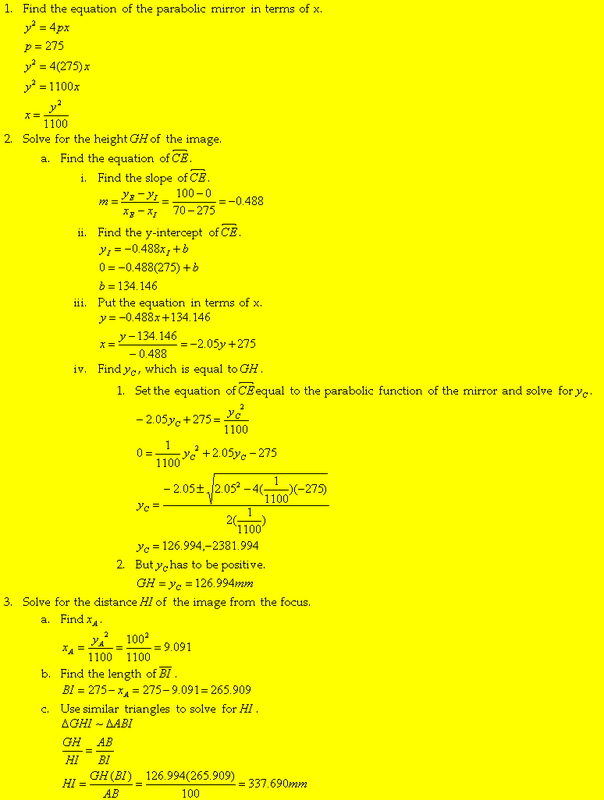 You can also use paraxial approximations to approximate the height of the image and its distance from the focus. 2. Use similar triangles to approximate the height GH of the image. 3. Use similar triangles to approximate the distance HI of the image from the focus. 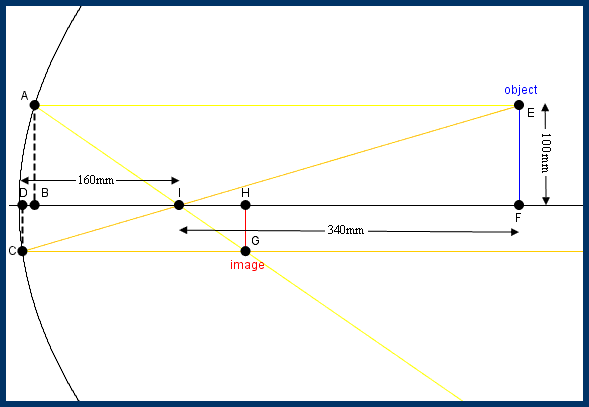 Problem: Given a concave parabolic mirror with a focal length of 160 mm and a 100 mm tall object that is placed 340 mm from the focus, find the height of the object's image and the distance of the image from the focus (Notice that the rays are in different places because the object is outside of the focal point). We can shorten calculations by using a paraxial approximation, which basically assumes that the middle portion of a mirror is flat. In the diagram below, the rays form two pairs of approximately similar triangles. We can use these similar triangles to find the height and position of the object. 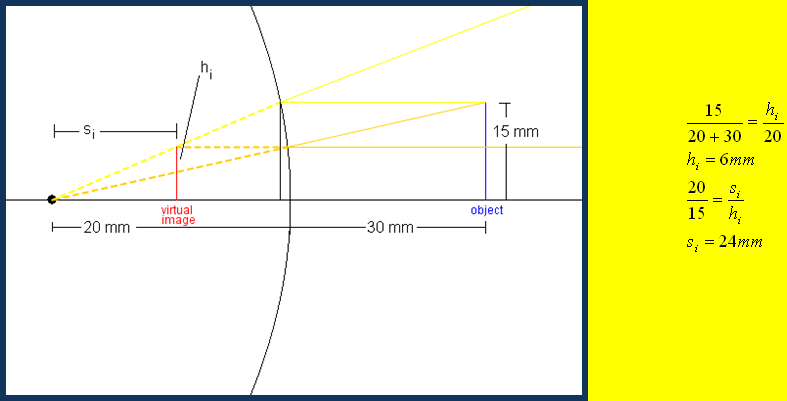 Problem: Given a convex parabolic mirror with a focal length of 20 mm and a 15 mm tall object that is placed 30 mm away from the mirror, find the height of the object's image and the distance of the image from the focus. Now that you've been introduced to the math, look at these Applets!